Many toys can offer not only fun, but a learning experience for kids as they play with them. Some are so much fun, youngsters don't even realize they're also being taught as they play, according to Marianne Szymanski, president of Toytips.com. She's co-authored a book called "Toy Tips: A Parent's Essential Guide to Smart Toy Choices." 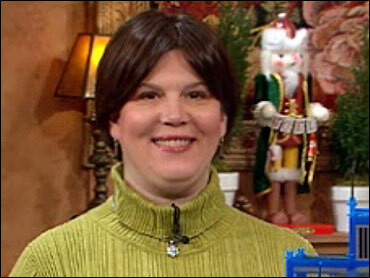 The Early Show co-anchor Rene Syler Wednesday that she always advises parents to "be your child's own toy expert. Do some research ahead of time to find out the toys you know they have skills for and that they will play with. Because they do want everything but you don't necessarily know if they can actually play with them." She had several suggestions for viewers, and split them into three categories: visual, auditory, and tactile learning. THE VISUAL LEARNER: A child who learns most readily using visual cues will take to a toy that builds on this trait. Toys that involve flash cards, memory games and picture books fit this bill. Videos will be appealing. Also, puzzles, building toys and craft kits tap into visual skills. Warren Industries Esphera 360 Puzzle: This is really cool because it's 3-D. Picture a globe, because that's what the finished puzzle will look like. It's more advanced than other puzzles, so it's more appropriate for an older age because of its difficulty. This is good for kids who are school-age, meaning about 5 and up, and it's great to do with the family. What parents do have to realize is that not all puzzlers, which is what people who do puzzles are called, puzzle in the same way. Some people can't ever put together harder puzzles, so don't buy this for someone who's never done a puzzle. You want it for someone who does puzzles and likes them, and this is multi-dimensional. Girder and Panel Tekton Building Set: This is a construction set that enables kids to build tall towers. It's originally from the 1970s, and it's basically a plastic panel with plastic girders you use to build a tower. It's been taken off and brought back to the market several times. It's not like Legos, which you snap together, or erector sets, where you use tools. This is all about building height to build a tall tower; it's not about building flat, horizontal things. Construction toys are popular because kids like to build and destroy things from very early on. This is for a more advanced builder. A child of about 4 or 5 could do it with a parent or caregiver helping. Otherwise, it's for kids a little older. When you're using construction toys, you're using sensory and tactile input to design them, and you're creatively thinking about what you're building and how to design it. And then when you're done, you can destroy it and start all over again. Books are generally underestimated. Reading a book at young ages is a terrific and important thing to do for your children. They're hearing your voice, and they're hearing sentence structure and seeing pictures at the same time. But, read the books ahead of time to make sure they're appropriate for your child. You may think that since it's a children's book it always is, but that's not true. Or it could have content you just don't want in your house. Books are important for kids, and today there are devices that can read to your kids. The good thing about them is that kids can do it independently, and can follow along because it's fun and it's a toy. "Play Along Care Bears Share A Story" is an example of something that can read to your child, but it shouldn't be used as a substitute for you reading to your child. Don't avoid reading to your child because you have something like this. Kids like this one because it's a stuffed bear and kids identify with their stuffed animals. With this bear, as they're learning to read, they can sit down with their book and listen to the story, and it's a toy. It's educational, it's a tech toy, it's an imagination toy. Ages 3 and up. Batman Computer Tech toy: You press the top of the little laptop and it pops up and the wings come out of the sides and it makes a music sound. It's like a role-playing toy: He's Batman! There are numbers games where it'll say something like "One, two, blank, four" and you have to push three to fill in the blank. It's battery operated and has all sorts of learning games, such as spelling and math. But it's cool. Your child may not want to play a math game, but he'll play with Batman. The education just follows, so they don't even know they're learning. The shell, the wings and the music are also really cool. Ages 5 and up. Sentence Says board game: Picture this: you have a card with a "T" on it, and your other ones have a "B, M, I, R and L" on them. So your sentence can be, "The big moose is running loose." You roll the die to see how many letter cards you get, and then you draw an action card to see what kind of a sentence you have to make. It's for two-to-six players, or it can be played in teams. I like to limit game times, so I'd recommend about 15 to 30 minutes per game. Otherwise, games could go on for hours. Basically, you have to make up the sentence and each word has to start with one of the letters on your cards. Ages 7 and up. Folkmanis Puppets: These are really cute puppets, and they're really well made. The benefit of using puppets can be achieved by any kind or brand of puppet. It's definitely more about the general idea, but these happen to be terrific puppets. As a side note, when it comes to washing puppets you should check the label — you can usually put them in the washing machine, but I let them air-dry. Most of the time when you're playing with puppets with your kids, the adult is the puppet, but it's also important that you encourage the child to be the puppet, as well as to listen. They can tell make-believe stories and use the puppets to act out discipline scenarios, but the main purpose of puppets is storytelling. Using your hand means using tactile skills. And a lot of kids use puppets as stuffed animals. Etch a Sketch: This is the classic toy that everyone remembers using. You're creating a design that's vertical and horizontal, with no curves. You're using memory, logical reasoning and skills, and also using a lot of concentration to create what you want. It's imaginative and hands-on, but it's really a thinking toy. What I love is that you're using the knobs to create the picture, so you're using emotion with cause and effect at the same time. It's a classic because it's fun, and when you get into it, you really get into it. Parents always want to know why old toys are coming back and it's really for two reasons. One is that it's re-introduced because it was such a fun toy years ago. And second, we want to give our own kids the toys we had and we do like to have those experiences with our kids and be able say, "I had that too!" Super Snow: With this toy, you pour a specific, measured amount of water in with the powder formula and stir it together. It gets kind of slushy and then it gets to be more like snow. If you put too much water in, it'll stay like slush. It has to be perfect to create the snow, so it introduces the science of how mixtures work. It's creative. You just put your hands in it. You can hold it and smush it around. It's different and got a really good review from the teacher we use for science toys. Dr. Dreadful: This is a craft toy for kids. The idea is that kids like to make disgusting things to eat, so with this they can make things such as creepy crawlers, worms and brains. It's basically like gelatin and you let it dry and then eat it. Kids love it. It's all about adding water and stirring and mixing, but cooking is learning because it incorporates measuring, science and math. Reviews of all the toys Szymanski suggests can be found on Toytips.com.